Chet Baker Sings - Baker,Chet LP Free Shipping! Chet Baker Sings is ranked as the best album by Chet Baker. Members who like this album also like: Kind Of Blue by Miles Davis, The Shape Of Jazz To Come by Ornette Coleman and Mingus Ah Um by Charles Mingus. 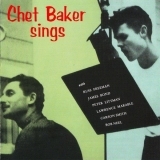 Related links: top tracks by Chet Bakertop tracks of the 1950s, top tracks of 1954. Showing latest 5 ratings for this album. | Show all 157 ratings for this album. Related links: top albums of the 1950s, top albums of 1954. Jazz super influente no Brasil e no mundo. By Good. Chet is the predecessor of any sad man, with any kind of instrument. This is 1954! He don't wail, he don't try, he just does. Please try him out. Preferable with inears on a sad cafe/bar in a strange country, or just your local inn. Very smooth voice. The music is not my cup of tea. I feel the focus is on voice and lyrics and musically is boring. Stunningly creepy wonderful record. Chet had one of the smoothest voices I've ever heard. Very boyish. My Funny Valentine made my skin crawl. I doubt Chet intended for this record to be so melancholy and disturbing but he succeeded elegantly. An instant hit with me. It's a talentet voice, but I don't like the tone in his voice...just not for me.